2018 seems to be dragging a bit with some sort of slowdown in the PCGS world. We have been waiting on the return of a bulk submission for quite a while and we got word that it made it back to JB for analysis and pictures. So during April we will be adding these coins to the web site. We sent in another 20 coins for a raw bulk submission and with the other 20 this would move us very close to our 1,000 coin goal. With 978 certified coins and another twenty in the bulk submission route we are very close. We are assuming that the LVA January Supplement will be delayed a month or so, but this one will be important for us. JB asked for clarification on several VAMs that we believe are duplicates. The most important of these may be the overlap between VAMs 21 and 25. I got a phone call from Mhoemi early in March about a discovery he had made looking at our die crack analysis of obverse dies. I have to confess that I just missed this one. The obverse dies for VAMs 1J, 1K, 20, and 40 seem to all be different states of a single physical die. We will give ourselves a little pass because we do not have a VAM 1K in our inventory, and we only looked at those we have to study directly. But we all overlooked VAM 1H which shares this same pattern for the obverse die, so we are throwing it in the mix. It is possible that VAM 1I is in this mix, but we lack images in our inventory or the VAMworld inventory to verify it. But we could have pick up on the others with a little help, which we got from Mitch. So a big thanks to him for the catch. But this also plays into another constant discussion on VAMworld about dies. Specifically the difference in a physical die (the round metal thing) and die characteristics exhibited by a die at the time of striking. The die designations on VAMworld are in the latter category and this tends to lead to a confusing discussion, especially when the dies demonstrate clear physical characteristics that are the same. That said, it might be time for some revisiting of those issues with those of us who have time for specialized studies. To add to the discussion I have pulled images of the hair curls at the base of the neck, which is one of my favorite discussion items at times like this. We might just be stuck on western discoveries of gold and silver, or maybe that is all the new documentaries that are out there to read. But whatever the reason we keep running into interesting books about western migration to search for precious metals. Now in that list is a book titled The Trail of Gold and Silver - Mining in Colorado, 1859-2009 by Duane A. Smith. This one held some special interest because we have children and grandchildren living in Denver and that proved to be one of the centers of activity. Then there is another connection between the twenty-niners who mined gold in north Georgia and then migrated to Colorado and became fifty-niners. We also discovered why many place names in Denver are connected to the gold rush, and interestingly to Georgia. This one is well written, easily read, and interesting. We can recommend it to anyone interested in the pursuit of metals in the west. 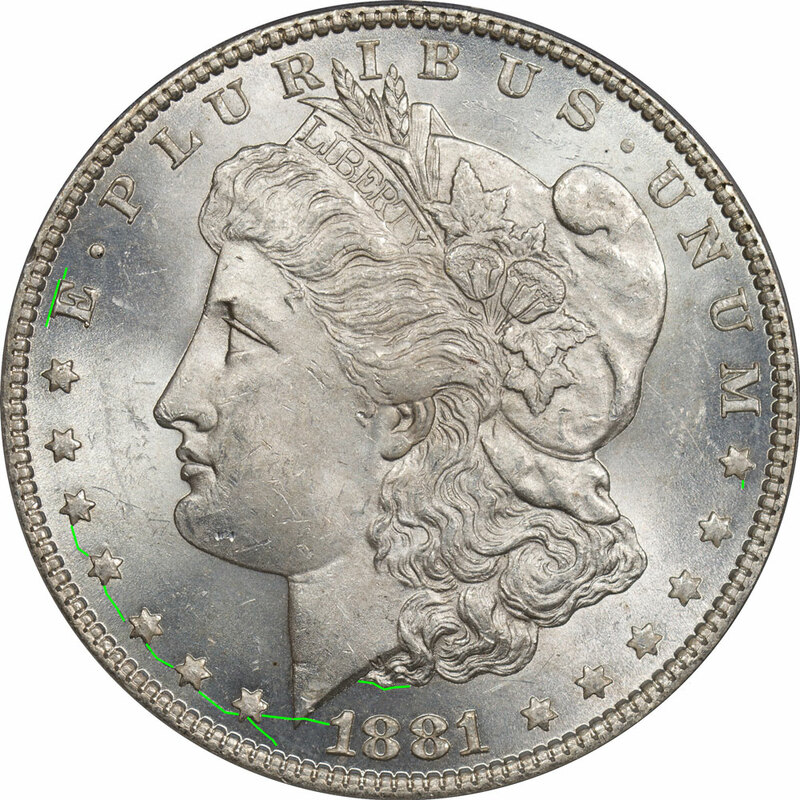 This Obverse Die 1 is associated with many VAMs, but two of them are of particular interest. First is VAM 1H - Die Gouges Inner Wing #2. We have many examples of this VAM for study so a lot to work with. As listed this die shows the same physical die cracks and characteristics as VAM 40 but the progression of the die cracks just isn't as far along. The hair curls show the same loss of detail as VAM 40. Since dies lose detail from the field forward the termination of these curls looks to be from a die that was repolished. 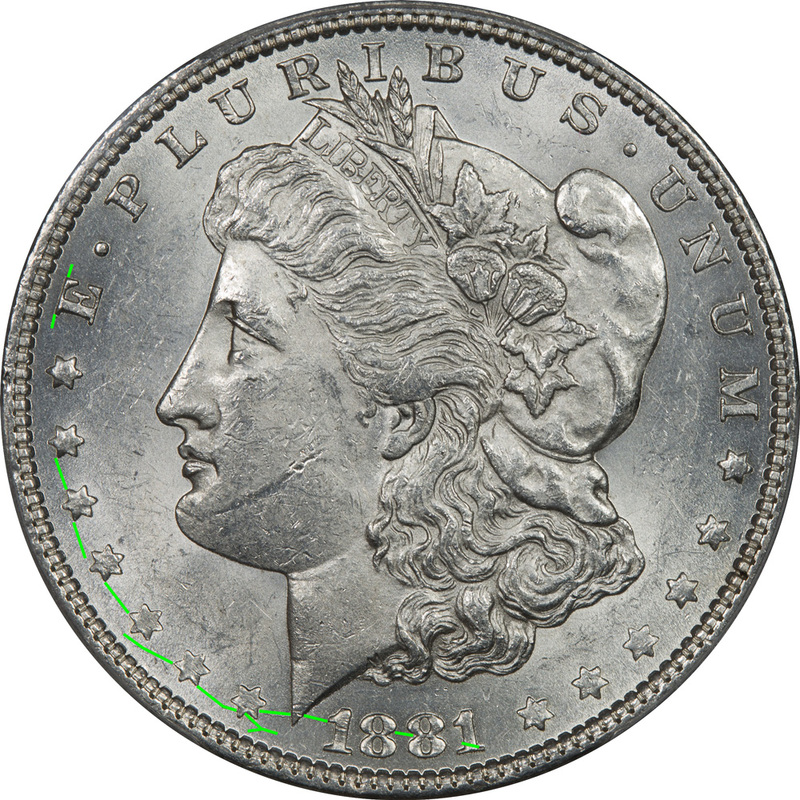 Obverse Die 1 is associated with many VAMs, but two of them are of particular interest. One of those is VAM 1J - Overpolished Reverse. Unfortunately we have only one coin and it is an Almost Uncirculated 58, so a few of the die cracks were not as visible as on the others. Die cracks that appear on the high points of devices will for sure wear away quickly and might not appear here. This is also an earlier use of the die than VAM 40. But we want to make another observation that I always enjoy. Since dies lose detail from the field forward the termination of these curls look to be from a die that has not been repolished and is relatively fresh. Obverse Die 1 when paired with a specific Reverse Die a forms a clashed version of both the obverse and reverse dies and receives the designation of VAM 1K. We lack an example of a VAM 1K - Clashed n and st so this link is to VAMworld. 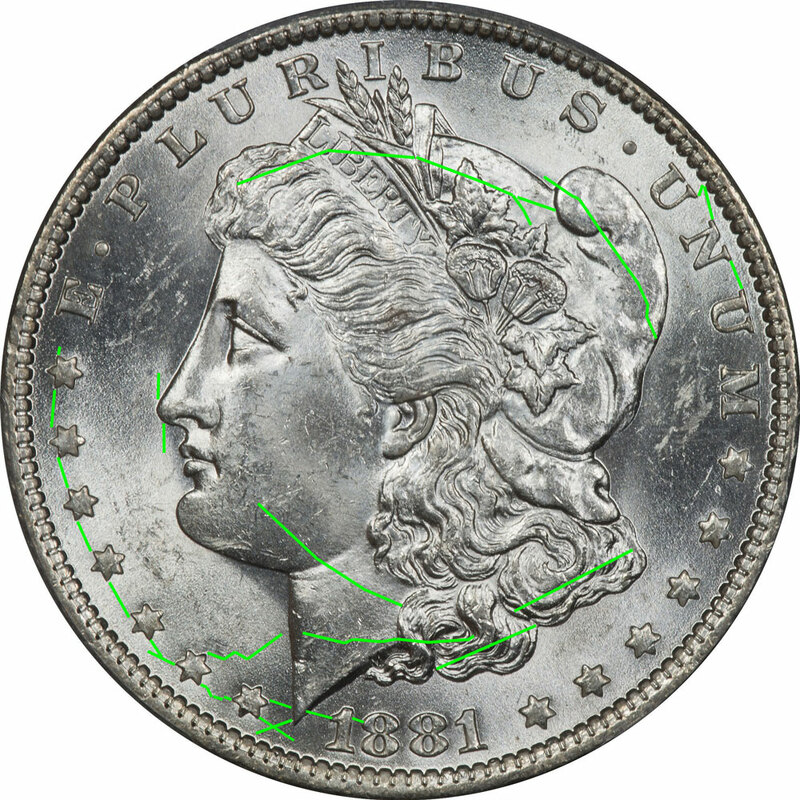 Our observation from the discovery coin is that the die cracks that start with the left stars and then extend down through the neck and on into the date are there. The VAMworld coin is also a circulated coin in the Fine range. So any additional die cracks on the higher points of the face or hair would have quickly disappeared and we don't know if they were present. The termination of the hair curls on VAM 1K also appear to be full or nearly full. This is a feature that is very low in the relief, so wear does not effect it until you get way down in grades. The VAMworld coin is in Fine condition and at that stage only the tops of the hair curls are worn away. Obverse Die 12 when paired with a specific Reverse Die a forms VAM 20. We have several examples of VAM 20 for study, so there is lots of material in different grades. The die crack pattern appears to be identical to the others, just not as advanced. The termination of the hair curls on VAM 20 is nearly identical to VAMs 1J and 1K, so there was no repolishing before the reverse die was changed (if it was). Obverse Die 27 is associated with only VAM 40 - Doubled Ear Inside and Bottom. We have several VAM 40 coins, 21 as of this analysis, and they range from Good 04 to Mint State 64. These images are from a Mint State 64 coin. Die 27 has a number of cracked areas, several that are internal to the device that distinguish it from others. But one clincher is the unique vertical die crack above and below the nose. We checked this feature on several VAM 40 coins and it is consistent. This die appears to have been repolished and there is a deterioration of the curls down at the field level. This termination is the same as with VAM 1H. Emission sequences are new for us and therefore we need verification of this work. But we see a clear delineation of the die use into before and after the repolishing, with VAMs 20, 1J, and 1K coming first and in that order. Then we believe the die was pulled from service and polished to try and save it, put back in service only to have it fail again. On that second round the sequence of use was VAMs 1H and then 40. It is possible that VAM 1I is in this sequence but we need more evidence to confirm that addition. Right now these five VAMs have three different obverse die designations. VAMs 1H, 1J, and 1K are all designated as Obverse Die 1. VAM 20 has a die designation of 12, and VAM 40 has a die designation of 27. However, one of the challenges with VAMing can be having all the coins in the same place at the same time to compare features. In this case we can do an 80% comparison on typical features to see why these VAMs have different die designations and are they correct. And we are sure we can get a little help with VAM 1K once we work with these four. So our challenge in April will be the analysis of the obverse die features for these five VAMs.